The human head can be subjected to several impactful loadings, such as those taking place due to falls, injuries, road accidents, etc.. These loadings may result in skull fracture, and in some cases, part of the skull may need to be replaced by a biomedical implant. Accidents may also lead to brain swelling, which can be treated by decompressive craniectomy. Cranioplasty is a neurosurgical procedure that is used to repair cranial defects resulting due to traumatic brain injury (TBI), brain tumors, and hemorrhagic diseases. This procedure is conducted with the aid of cranial implants. Earlier, several different types of materials were used for cranioplasty. With technological advancements, new materials and technological interventions are available, providing specificity for the patient population according to the treatment and surgeon. Increase in technological advancements, such as implant computer-aided design, 3-D printing, and regenerative medicine has resulted in the advent of 3-D-print patient-specific implants that can be made from a variety of materials, including polymer, ceramic, or metal. They are more effective and accurate for treatment and help surgeons achieve increased success rates. Also, factors such as a rise in the geriatric population, increase in demand for customized cranial implants, and rise in the number of injuries and road accidents are boosting the growth of the cranial implants market. Furthermore, an increase in research and development activities and studies and rise in awareness are also anticipated to boost the cranial implants market. The global cranial implants market has been segmented based on product, material, end-user, and region. In terms of product, the market has been classified into customized cranial implants and non-customized cranial implants. The non-customized cranial implants segment is expected to hold a significant share of the market, while the customized cranial implants segment is expected to expand at a significant CAGR of 7.1% during the forecast period. Customized cranial implants are considered to be specific and well-fitted according to the cranial defects, save operating room procedure time and aid surgeons, may render the procedure less invasive, and reduce the risk of infection and complications. Generally, non-customized implants comprise traditional methods for cranial implantation. The number of non-customized implant products available in the market is higher. In terms of material, the global cranial implants market has been classified into polymer, ceramic, and metal. The metal segment is projected to hold a prominent share of the market, while the polymer segment is anticipated to expand at a significant CAGR during the forecast period. The metal segment is estimated to expand at a CAGR of 6.8% during the forecast period. The most commonly used metal is grade 5 surgical titanium (i.e., Ti-6Al-4V), usually referred to as ‘titanium’ or Ti-6-4. Metal is used in the cranium for fixation devices (e.g., plates and screws), solid plates, or mesh, or in combination with other materials such as ceramic components or inert plastic. The availability and long-term success rates of metals such as titanium, specifically related to resistance to infections, have contributed to their leading position in the cranial implants market. In terms of end-user, the global cranial implants market has been classified into hospitals and neurosurgery specialty centers. The hospitals segment is expected to dominate the market and expand at a CAGR of 6.9% during the forecast period. This is due to a rise in the number of hospitals, high surgery volume, and rise in the number of medical professionals. Based on region, the global cranial implants market has been segmented into North America, Europe, Asia Pacific, Latin America, and Middle East & Africa. North America is expected to dominate the global market and account for a prominent share in the coming years. The market in North America is primarily driven by a rapid increase in the geriatric population; rise in the patient population; high prevalence of trauma, injuries, road accidents, and brain cancer cases; and increase in the acceptance of technologically advanced cranial implants. 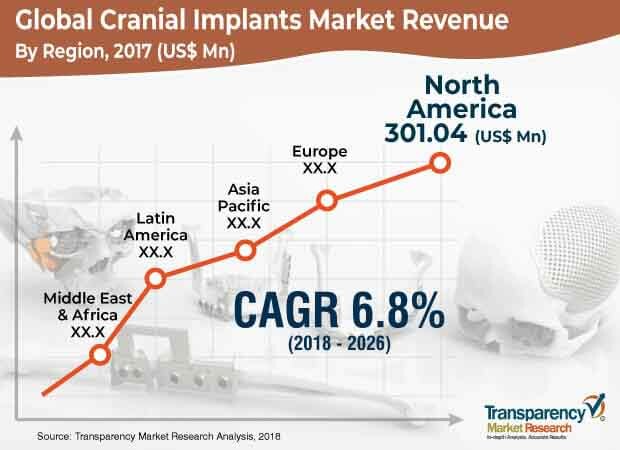 Moreover, increase in awareness among people, rise in the number of players and products, and substantial focus on research and development are anticipated to fuel the global cranial implants market in North America during the forecast period. According to The American Association for the Surgery of Trauma (AAST), in the U.S., traumatic brain Injury (TBI) is the single largest cause of death from injury. The market in Asia Pacific is anticipated to expand at a rapid pace during the forecast period. The market in the region is estimated to be augmented by the presence of a large base of geriatric population, government initiatives in the health care field, expansion in research and development activities, and improving health care infrastructure. Companies such as Zimmer Biomet, Stryker, Kelyniam Global Inc., accounted for a major share of the global market in 2017. Increase in the number of technological advancements, rise in approvals from government bodies, acquisitions and mergers, and research and development are the key factors strengthening the position of these players in the market. In October, 2018, OssDsign AB, a distributor and manufacturer of regenerative implants for facial and cranial reconstruction, received 510(k) clearance by the U.S. FDA for the marketing and sale of its latest product, OSSDSIGN Cranioplug. Its implant is used during neurosurgical procedures, and it is made from an osteoconductive calcium phosphate ceramic composition reinforced with a titanium mesh plate. In October 2018, Kelyniam Global Inc., , submitted its third 510(k) application to the FDA for expanding its line of custom implants. Companies are adopting the strategies of acquisitions and collaborations with parallel companies in order to improve and strengthen their presence in the global market. Cranial defects can occur due to injuries, infections, and tumor invasions. They can also occur when it is not possible to replace the autogenous bone after a decompressive craniectomy because of brain infarction or hemorrhage. Reconstruction of cranial defects should take place for protecting the brain and normalizing cerebral hemodynamics. The foremost aims of cranial defect reconstruction are protecting the brain or improving cranial appearance. Neurosurgeons use different techniques for precise planning in cranial defect surgery. Surgeons prefer cranial implants with high grades of biocompatibility and mechanical properties. Cranioplasty is a neurosurgical procedure involving the repair of a cranial defect or deformation caused due to trauma, neurosurgical procedures, tumor, and infections. The main indications for cranioplasty are protecting the cranial contents and, in children, the provision of an intact cranial vault for normal development and growth of the brain. Aesthetic and psychosocial implications are also required to be considered. The ideal material for undertaking cranioplasty should be malleable to fit precisely even complicated cranial defects and should meet other various requirements depending on the cranial defect. With technological advancements, the availability of new materials and technological interventions has increased. This offers specificity for the patient population according to the treatment procedure and surgeon. Increase in the geriatric population, rise in the number of trauma cases, increase in research and development activities, and enhanced public health awareness and measures have led to rapid and effective medical interventions. Increase in the number of technological advances, fuelling the need for efficient and effective cranial implantation, is likely to offer a significant opportunity to key players operating in the market. Value added features offered in cranial implants are prompting medical professionals worldwide to adopt technological advancement-aided cranial implantation. Key players offering cranial implants are introducing value added features and technological advancements, such as 3D-printing, CAD/CAM modelling, and patient specific and effective cranial implants. Increase in acquisitions and approvals and rise in government approvals of cranial implant products are boosting the global cranial implants market. Customized cranial implants, bytechnological advancements by key players, and approvals by government after voluminous research and development activities are key trends for among market players for expanding their geographic presence and strengthening their position in the market. For instance, in March, 2016, the U.S. Food and Drug Administration (FDA) gave a 510(k) clearance to a 3D-printed titanium cranial/maxillofacial implant manufactured by BioArchitects. It is a U.S.- and Brazil-based company. This important approval marked the start of the company’s marketing for the device in the U.S. The global cranial implants market has been segmented based on product, material, end-user, and region. In terms of product, the global cranial implants market has been divided into customized cranial implants and non-customized cranial implants. The customized cranial implants segment is expected to expand at a rapid growth rate during the forecast period as customized cranial implants are technologically more advanced and patient specific. Based on material, the global cranial implants market has been categorized into polymer, ceramic, and metal. The metal segment is expected to lead the global cranial implants market during the forecast period due to the availability and long-term success rates of metal implants because of their resistance to infections. In terms of end-user, the global cranial implants market has been bifurcated into hospitals and neurosurgery specialty centers. The hospitals segment is expected to dominate the cranial implants market attributing to an increase in the number of hospitals, rise in the number of neurosurgical procedures, increase the number of medical professionals and trained staff, and rise in patient population.